MOM-n-PA is an annual two-day free dental clinic for underserved Pennsylvanians in which dental treatment is provided at NO COST to individuals who cannot afford dental care. Treatment is provided on a first-come, first-served basis. It is expected that hundreds of individuals will be attending this year's event, so please come early! Patients do not pre-register. All services are provided free of charge by a host of dedicated volunteers. OUR NEXT MISSION IS ON JUNE 7th AND 8th 2019! THANK YOU to all of our volunteers that made our 2018 READING mission such a big success! Together, we donated over $1,032,359.00 worth of dental services to the underserved!! We believe the heart of dental care is service to others. We believe in our commitment to the communities around Pennsylvania to treat the underserved without pride or prejudice. Each year our mission is to serve as many individuals as we can and get them back on track to good oral health. 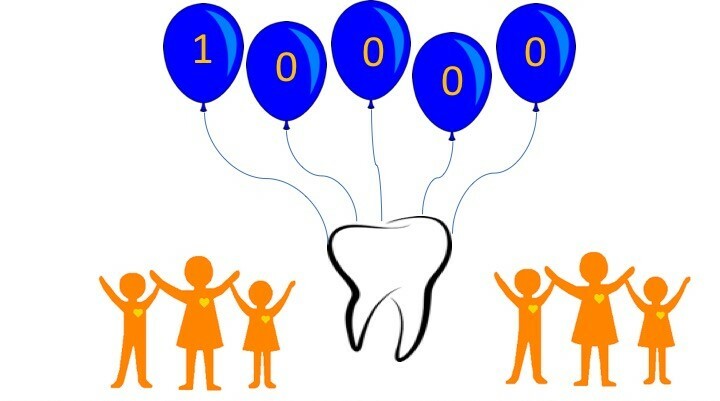 We are very excited, as this year, we will meet a significant achievement in treating our 10,000th patient since our mission started in 2013. We wouldn't have been able to reach this incredible milestone without our sponsors, dedicated volunteers, and everyone else who has helped throughout the years. Come early! Patients will be lining up starting Thursday evening. MOM-n-PA provides dental care for the relief of pain to thousands of the most needy, many of whom are from working families who do not have access or cannot afford dental insurance. Many of these patients might otherwise have no hope of receiving care. Dr. Lew Lampiris described his experience as a volunteer as "transformational" and went on to say, "Here we were, standing side by side, working together and doing what we've been trained to do, provide necessary dental care to those in greatest need." Though all dentists and support personnel are volunteers who donate their time, there are still thousands of dollars of expenses involved in operating these free dental missions. These include dental equipment and maintenance, dental supplies, food, water, and t-shirts for volunteers, as well as food and water for patients waiting in line, and numerous other miscellaneous expenses. Though we have several generous corporate sponsors, we gladly accept (and need) donations of any amount! You can easily and conveniently make an online donation by clicking on our "Donate" link. MOM-n-PA is a 501(c)3 corporation, but please consult with your tax advisor if you have questions about your donation. You can also mail your donation directly to our foundation! THANK YOU to all of our volunteers that made our 2018 READING mission such a big success! Together, we donated over $950,000 worth of dental services to the underserved! !